The moon passed into the Earth's shadow before early today (April 4), turning most of the lunar surface a deep, blood-red color in a total lunar eclipse that lasted less than 10 minutes at its peak, making it the shortestof its kind this century. Photos of the total lunar eclipse show a highly variable and unique color pattern on the lunar surface, which included shades of deep blood red, rusty orange, pale yellow, grayish blue and white. Collectively, the different colors created a stunning "rainbow" on the moon's surface, according to some observers. Veteran skywatcher Maxim Senin of Redondo Beach, California combined multiple exposures to create this time-lapse view of the total lunar eclipse of April 4, 2015. Skywatchers in North and South America, Australia, Oceania, and Asia had a clear view of today's total lunar eclipse. Live views of the eclipse were streamed online by the Slooh community observatory. The Slooh webcast featured views from the Griffith Observatory in Los Angeles (which also hosted its own webcast), as well as feeds from Canada and Australia. NASA's Marshaell Space Flight Center also featured the Griffith Observatory feeds and included commentary from NASA lunar experts. In the U.S. and Canada, the total lunar eclipse was briefly visible east of the Mississippi river, before the moon slipped below the horizon. (Here in Brooklyn, New York, the sky was too overcast to see the moon at all). Some regions along the east coast of North America saw only a partial lunar eclipse. "I just saw a partial eclipse this morning," reader Laura Austin, of Sarnia, Ontario in Canada, told Space.com via email. "The moon ran out of sky and slipped behind the trees." Further south, the view was no less spectacular, despite being only a partial view. Skywatcher A.M. Miller captured views of the partial eclipse as the moon appeared low on the horizon. "As I'm located in Fort Lauderdale, Florida, I was only able to view a portion of the recent eclipse," Miller said. "It was amazing all the same, hope you enjoyed it as well." Meanwhile, viewers west of the Mississippi were able to observe the moon for much longer. Veteran skywatcher Maxim Senin created a mesmerizing composit view of the eclipse from Redondo Beach, California. Senin used a feature on his Canon 70D camera that assembled nine different exposures into a single image. A partial lunar eclipse slips behind trees in this predawn view from Fort Lauderdale, Florida captured by skywatcher A.M. Miller early on April 4, 2015. A total lunar eclipse was visible at other locations on Earth. In Las Vegas, Nevada, veteran astrophotographer Tyler S. Leavitt captured his own stunning view of the lunar eclipse (top image). "Ran out this morning to catch the lunar eclipse. I was trying to compose this shot for quite some time to get it right," Leavitt wrote in an email to Space.com. 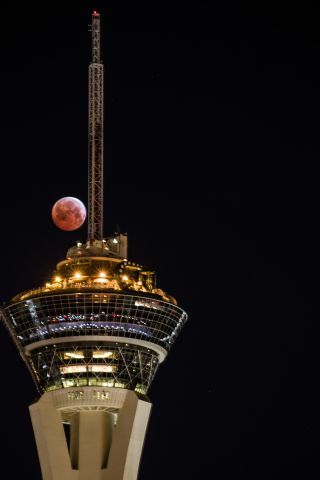 "This is the 'Stratosphere' tower/casino in Las Vegas with the fully eclipsed moon in the background." A total lunar eclipse occurs when the moon is fully submerged in the core of the Earth's shadow, called the umbra. The outer ring of the shadow is called the penumbra. When the moon passes into the penumbra, it darkens the surface of the moon, making it look as if a "bite" has been taken from the lunar surface. "Totality" occurs when the moon is completely submerged in the umbra, and takes on a deep red hue because of light filtered through Earth's atmosphere. The shortest lunar eclipse of the century created a "blood moon" over parts of the United States and the Pacific Ocean on April 4. During today's lunar eclipse, the moon passed through the outskirts of the umbra, just barely becoming a true total eclipse. Because of the moon's close proximity to the edge of the Earth's shadow, some sunlight still illuminated the outer edge of the moon during totality. According to Slooh astronomer Bob Berman, even though the moon was technically submerged in shadow, some sunlight refracted or bent around the edge of the Earth and illuminated the moon's surface. "If we didn't know better we'd say this isn't totality yet," Berman said, referring to the fact that the moon was never entirely covered in red light. Berman spoke during the Slooh webcast, which was hosted by Eric Edelman and included commentary from Slooh astronomer Will Gater. Near the area illuminated by sunlight, part of the lunar surface also appeared to be slightly bluish grey, before fading into the rusty red region. With this rainbow color pattern, Edelman called it "fantastically unique." Berman said it was the "weirdest" lunar eclipse totality he'd ever seen. He said that beauty of the lunar eclipse transcends the popular "blood moon" phrase repeated in the media. "It's much more complex and much more interesting, visually sophisticated, than a single word can capture. It's very interesting," Berman said. He later added, "I'll never forget this eclipse." Slooh featured footage of the eclipse from the Griffith Observatory in Los Angeles, which also aired a webcast of the eclipse. Near the end of the event, about three hours after the moon began to enter the umbra of the Earth's shadow, the Griffith Observatory captured another stunning image: an airplane flying across the moon. The silhouette of the plane and its two evaporating contrails appeared dark against the brown color of the moon. "That's incredible, what a wonderful way to end the evening," observatory curator Laura Danly said. The next total lunar eclipse takes place on Sept. 28, 2015. That comes shortly after a partial solar eclipse on Sept. 13, which will only be visible in Antarctica, but there are many other awesome skywatching events in 2015 to look out for. For more eclipse action, the next total solar eclipse — when the moon appears to block out the sun — takes place in March 2016 and will be visible from Borneo, Sumatra, Sulawesi and parts of the Pacific Ocean. In August 2017, a total solar eclipse will be visible in the United States. Editor's Note: If you snapped an amazing picture of today's lunar eclipse and you'd like to share for a possible story or image gallery, send photos, comments, and your name and location to managing editor Tariq Malik at spacephotos@space.com.